Midwest Musical Imports is looking for full-time woodwind repair technician. Applicants should be experienced in all aspects of woodwind repair, preferably with a focus on oboe and bassoon repairs. We pride ourselves on quality repairs over quantity. Instruments we repair include: oboes, English horns, bassoons, contrabassoons, clarinets, flutes and saxophones. Our clientele includes beginning players, schools, college professors, and symphonic professionals. Qualified candidates should be a graduate of a band instrument repair course and have a basic knowledge/skill to different types of padding, adhesion, key fitting, dent and tenon work. Preferred skills include body cracks and tenon replacement, but on-site training for these is available. Other necessary skills include: machine tool operations, soldering/brazing, and understanding of levers, spring, hinges and threaded adjustments. Candidate will regularly work with customers and must be customer service orientated with good people skills. Pay is commensurate with experience. This is an hourly position. Current store hours are: Monday and Thursday 9-7, Tuesday, Wednesday, & Friday 9-5, and Saturday from 9-3. Schedule may be flexible. Location is in Minneapolis, MN, in a brand new, light-filled repair shop. Please send a resume and cover letter via email to: Jessica@mmimports.com Position is open until filled. Must be eligible to work in the United States. Qualified applicants will be contacted to schedule a bench test. Summer is that time of year when humidity increases and the wood body of instruments begins to expand. This happens along the width and length of the wood grain affecting both the fit of keys, levers, and tenons. When the wood expands in the summer months, woodwind instruments often don't fit together without a struggle, if they even fit together at all! We find that this issue is most prevalent during the first year of a new instrument's life, and especially prevalent in newer clarinets. If this happens with your instrument to the point where abnormal force is required to take it apart, it's best to have an experienced repair technician take care of it. A technician will be able to adjust the fit of the tenon cork, the exposed wood on the tenon, or sometimes both. Ignoring the problem and blowing warm, humid air down your instrument will only make it worse! The humidity will also make keys fit looser, but don't worry! We never fit keys too tightly in the summertime because they will most likely expand in the fall/winter and potentially bind once the humidity drops. Loose key fittings won't harm your instrument, they only cause them to be slightly noisier. If you can live with the loose key fitting in the summer, great! It should return to normal in the fall/winter. If it is an issue for you, we can certainly fix it, and if we do, don't forget to come back to get the fit readjusted after the humidity changes. If you ever experience issues with your instrument and don't know what to do, remember we are only a phone call away and are happy to help!! Introducing our newest repair technician, Brian! We are happy to announce that we have a new team member! Brian DeGayner has joined MMI in the repair department. He graduated from Southeast Technical in Red Wing with a diploma in band instrument repair in 2016. Prior to joining the repair team at MMI, Brian worked for Twin Cities Instrument Repair in Edina, focusing on flute and double reeds. He is a member of the National Association of Professional Band Instrument Repair Technicians, and attends state and regional conferences. Brian spends most of his free time outdoors, or playing in local orchestras. We asked Brian a few questions to get to know him better! What got you started in repair? "After a few years of playing horn, I realized my love for working with my hands could be applicable to the industry. After talking with Greg Beckwith, I dropped everything and went to Southeast Tech in Red Wing." What groups were you playing in prior to going to school for repair? "I have played for several orchestras around Minnesota. Mankato Symphony, St. Andrew’s, Bloomington Symphony, Minneapolis Civic, Wayzata Symphony, and currently St. Paul Civic." "I love Mahler’s symphonies, especially 3, 4, and 5. Ein Heldenleben, Holst’s Jupiter, Sibelius....basically anything horn-heavy. Otherwise, I’m usually partial to playing in small ensembles, such as Daniel Baldwin’s Landscapes for Clarinet, Horn, Bassoon and Piano, Martinu’s Quartet for Clarinet, Horn, Cello and Snare Drum, or Barber’s Summer Music." What is your favorite repair to do? I love a challenge. My favorite work to do is overhauling instruments: breathing new life into an instrument is very rewarding, and hearing an instrument I fixed on stage always makes me smile. I go hiking and camping as much as I can, year round. I am an Eagle Scout (Troop 494, White Bear Lake, 2009), so I basically grew up outdoors. My family moves a lot of timber every year, and I hunt and fish whenever I can. Please join us in welcoming Brian to MMI! We are so happy to have him part of our team! We will have special end of year hours for our physical location in Minneapolis. As usual, our online store is ALWAYS open! Sun., Dec. 31st through Wed. Jan 3rd--CLOSED for New Year's and our annual inventory. Thurs. Jan 4th--Normal business hours resume. Normal business hours are Monday to Friday 9-5 and Saturday 9-3. Thank you for you understanding and we wish you much peace, joy and success in 2018!! Happy holidays from all of us at MMI! Our tree is up, the decorations are hung and we're celebrating the holidays! From now until December 25th, 2017, we are offering special in-store and online savings. IN-STORE - Select an ornament from our tree (pictured above) and reveal special savings on accessory purchases and new instruments! ONLINE - All orders of $75 or more will receive free standard shipping! Purchase a new instrument from us and we'll refund your shipping charges and give you a $100 off! Thank you for your business and we wish you a very happy holiday season! To celebrate the start of the holiday season, we would like to offer all of our customers free shipping! Any online order placed from Thursday, Nov. 23rd through Monday, Nov. 27th and shipped in the US will receive free shipping! Shop small with us!! Saturday, November 25, 2017 is Small Business Saturday! We will be offering 10% off on all accessory for IN-STORE purchases. If you are not able to come in to the store, we will be offering free shipping within the US on all online accessory orders! Thank you for supporting your small woodwind shop, we greatly appreciate you, our customers!!! Our physical store will be closed on Friday, but our online store will be open!! Shop online and receive 10% off your accessory order, and get free shipping within the US!!! Valid only on Friday, Nov. 24, 2017! Happy Thanksgiving from all of us at MMI!!! We will be closed on Thursday and Friday to celebrate the holiday with our families. We will reopen on Saturday, from 9-3! Our online store will remain open during this time. Please shop www.mmimports.com We will have a special online only deal on Black Friday (10% off all accessories!) and we will be offering free shipping the entire weekend for orders shipped within the US! Have a wonderful holiday and happy music-making! Emily Brebach joined the Atlanta Symphony Orchestra playing English horn and oboe in the fall of 2012. Ms. Brebach, a Philadelphia native, has performed with several orchestras throughout the United States, including the Boston Symphony Orchestra, the Minnesota Orchestra, the Kansas City Symphony, and the Houston Symphony. In past summers, she has performed at the Grand Teton Music Festival, the Des Moines Metro Opera, Tanglewood Music Center, and the Aspen Music Festival. Prior to joining the ASO, Ms. Brebach held the position of English horn and oboe with the Sarasota Orchestra. Ms. Brebach holds degrees from Oberlin Conservatory and Rice University's Shepherd School of Music, and studied with Louis Rosenblatt, James Caldwell, Robert Atherholt, and Robert Walters. She is an Artist Affiliate Instructor of Oboe at Emory University, a faculty member of the Atlanta Symphony's Talent Development Program and maintains an active private studio in her home. Ms. Brebach has also given masterclasses and reedmaking seminars at the University of Cincinnati College-Conservatory of Music, Florida State University, the University of Minnesota, the University of South Carolina, and the North Carolina School for the Arts. She spends her summers in residence at the Brevard Music Center in Brevard, NC, as English horn and oboe as well as artist faculty. We look forward to seeing you at this great, FREE event!! RSVP here! 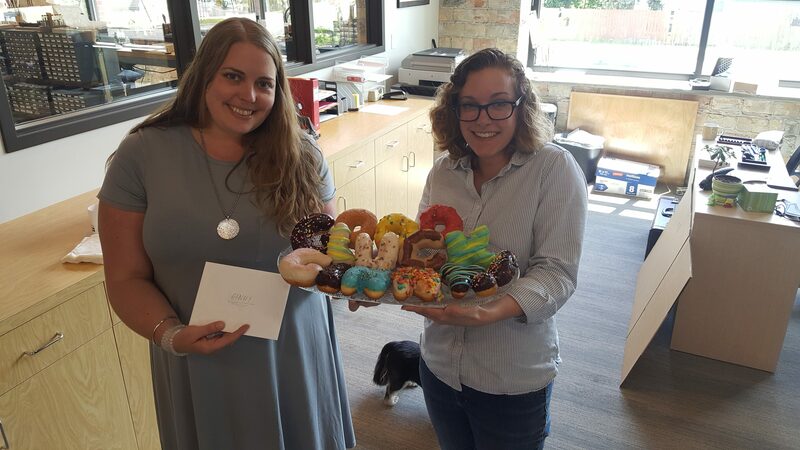 Ginny and Jessica with Ginny's going away doughnuts. I’d like to personally let you know that as of July 1st, I will no longer be repairing at Midwest Musical Imports. I will be moving to the Detroit, MI area to be with my fiancé and begin our next step of life together. I would like to impress that my time working for Midwest has been some of the best years of my life to date! That is due largely in part to the amazing community of woodwind players that we serve through the store. 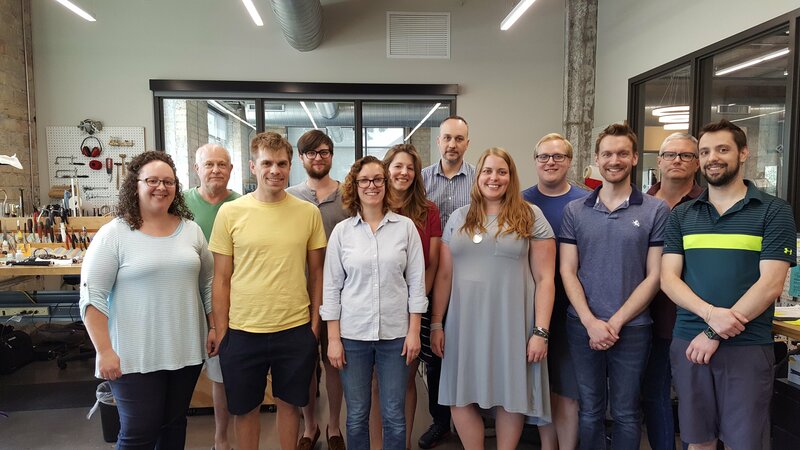 From double reed days to the annual IDRS conference to our in-store interactions, it has been an honor and a privilege to offer service to your instruments. If you’d like to keep in touch or let me know of your performances in Michigan, I would love to continue supporting your art in any way I can! My email is virginiardodge@gmail.com or you can reach me via phone at 585.245.4305. In the mean time, I’ll be saving my pennies to see you all in Grenada at next year’s IDRS conference! Be well and keep up the amazing artistry. We’re lucky to have all of you in our lives here at MMI! We will miss you, Ginny!!! Best of luck!!! Visit us at the 2017 ClarinetFest in Orlando!! !